You are currently browsing the category archive for the ‘Social Enterprise Search’ category. 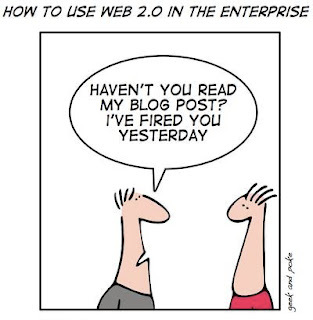 that is Web 2.0. Although being one of the organizers at the MIT CIO Conference I shouldn’t be critical about a panel but I could not resist posting this article. I was sitting in a panel on Enterprise 2.0 today at the symposium and I need to respectfully disagree with the distinguished panelists on what Enterprise 2.0 is. I was getting really frustrated when the panelists kept talking about platforms like LinkedIn, Facebook and Twitter, about how organizations should break down the barriers and leverage these platforms, ultimately getting onto the Enterprise 2.0 bandwagon. All the while I was sitting there and thinking to myself…. Are you guys kidding me? So you are telling me that if a Boss fires an employee tomorrow, he is going to do that through his Tweet or Facebook status or his blog? Or for that matter instead of sharing information within or collaborating within, I would expect my employees to sign on external websites and then hope that they’ll get their technical information there? Hell no! These platforms which are Web 2.0 and NOT Enterprise 2.0. can be leveraged by companies to their advantage in specific functions and in specific scenarios but that does not make these platforms Enterprise 2.0. For example efficient mining of data from these social media platforms as explained in my previous blog post can be used for marketing & sales especially by B2C companies and specifically by the business development teams in those companies. If I were a B2B company with employees focused on coding up the next big algorithm, I would never ever encourage them to spend their time on these social sites during work hours. If any executive did so (as some do by claiming to be tech friendly) it just results in decreased employee productivity and is detrimental to the organization. That information and time spent on social sites is of no use at all and does not add to company’s bottom-line. So the question is “What is Enterprise 2.0”?